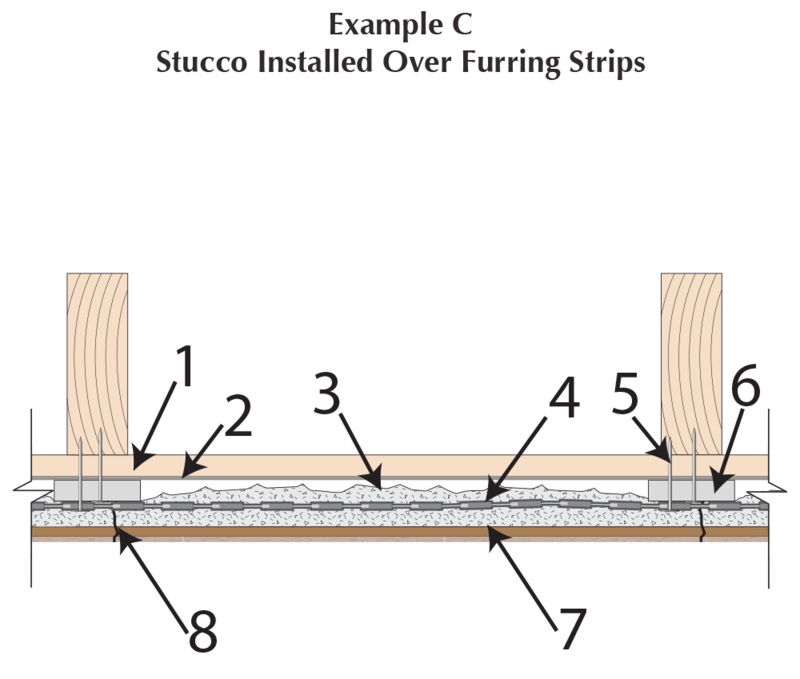 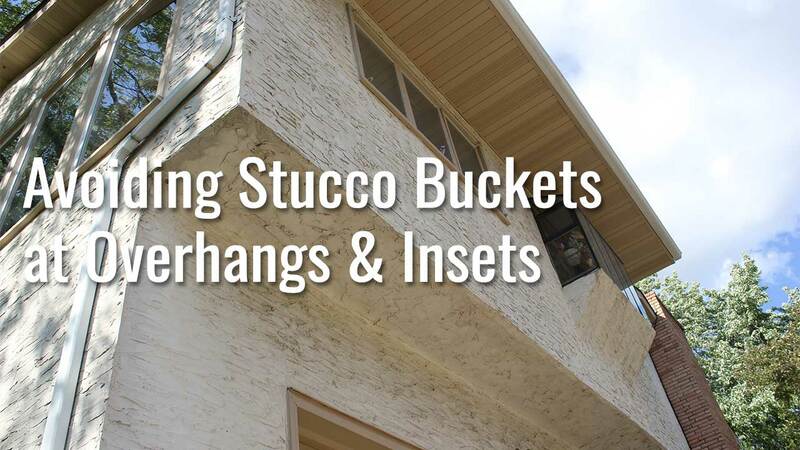 Stucco Archives | Masonry Technology, Inc. 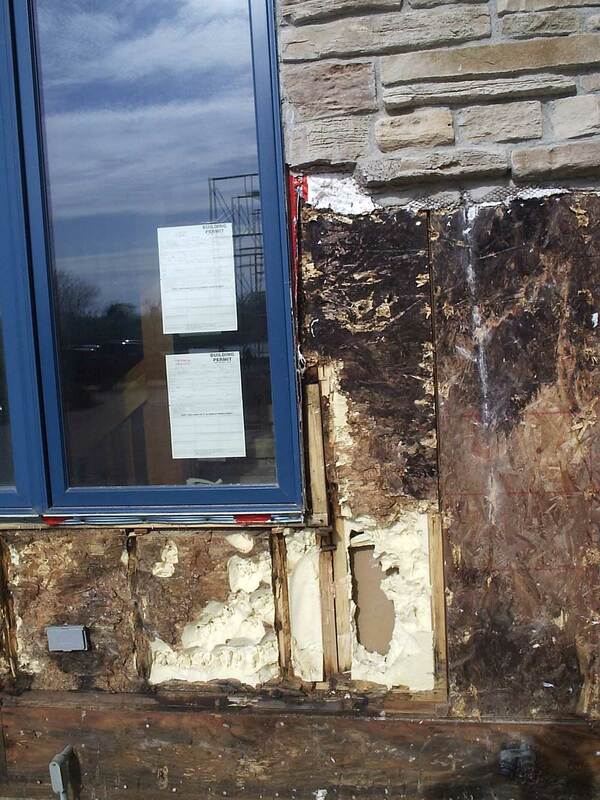 There are numerous factors/phenomena that create misunderstandings that result in improper or inadequate moisture management design for the exterior building envelope. 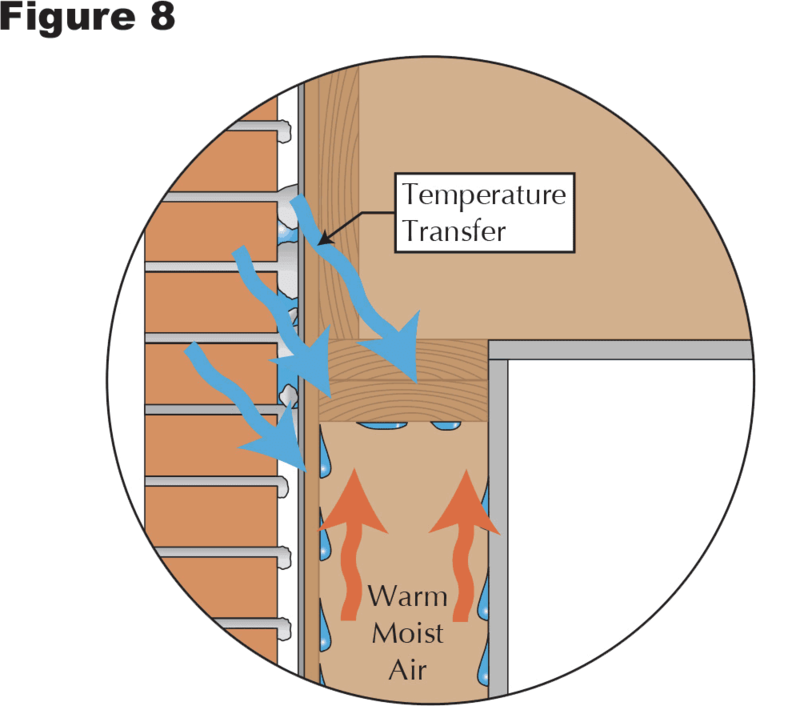 Let’s take a look at two of them, gravity and temperature. 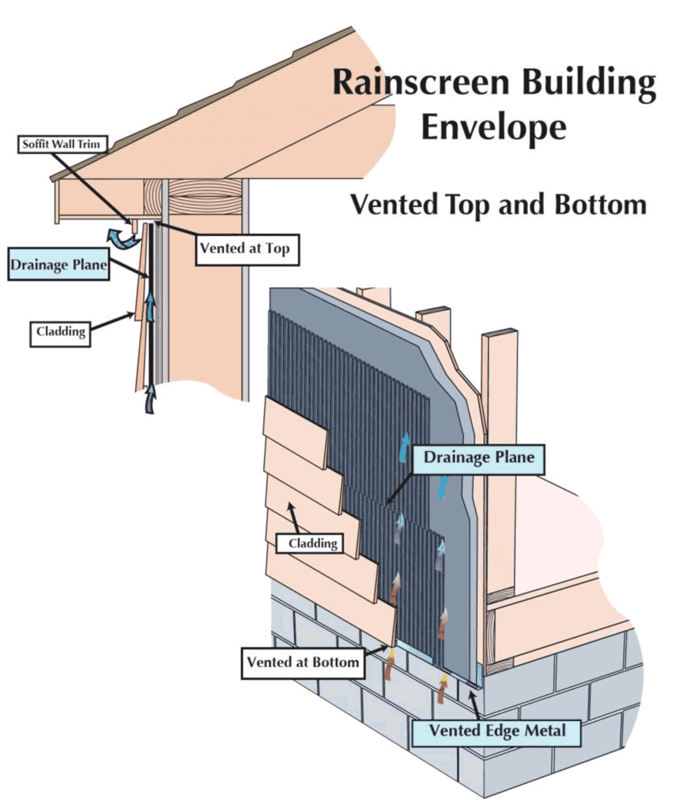 It’s the highest point that’s the wettest. 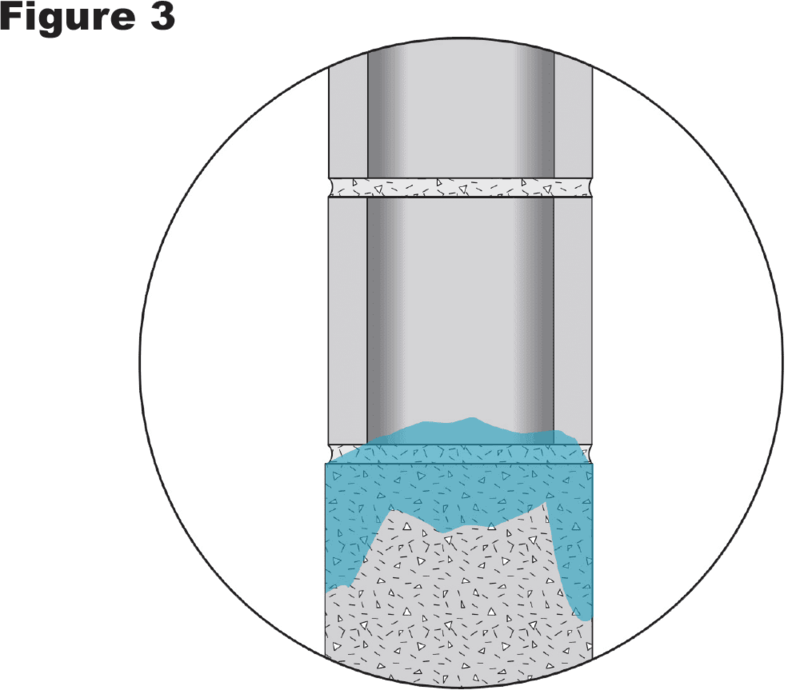 Why, because that’s where the water is! 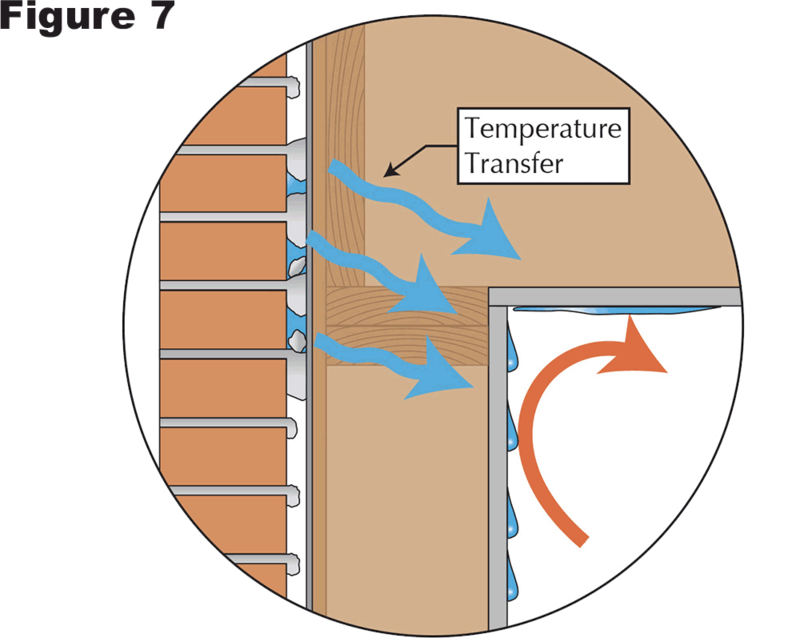 (see figure 6) That’s because of the influence of temperature. 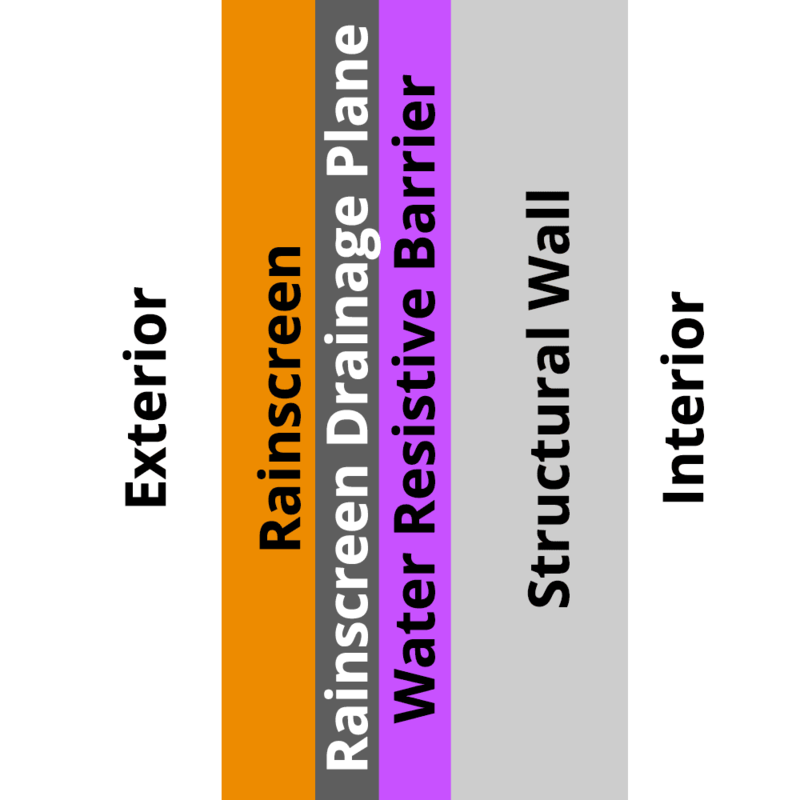 Everyone, or at least I hope every construction professional, can understand why a low point of a construction detail would be the wettest, but why would a high point/the top of a wall system be the wettest? The answer is found in the fact that H2O can be in three forms: a solid (ice), a liquid (water) and a gas (water vapor). 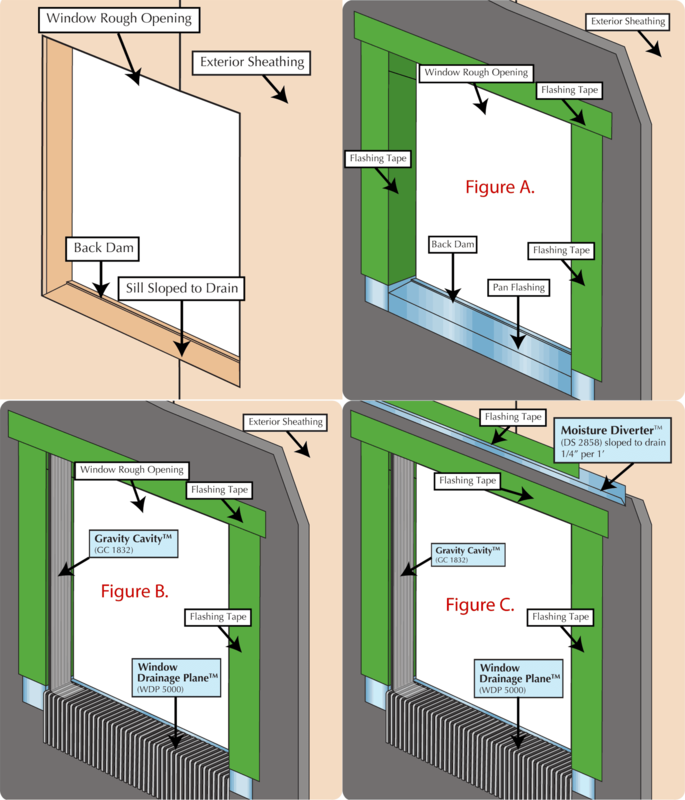 The most obvious conclusion is that there is a leak, a source of liquid water coming down and in from a higher point, and in most cases, that is exactly what is happening. 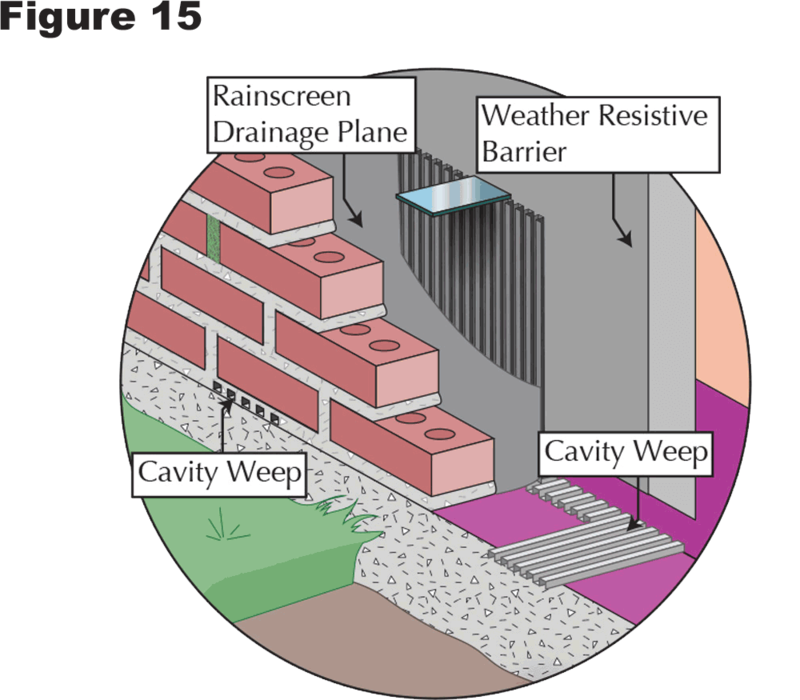 But there may be a number of other scenarios that could explain water and water patterns at a high point of an exterior wall detail. These distances will be expanded proportionally with the volume of the liquid moisture source. 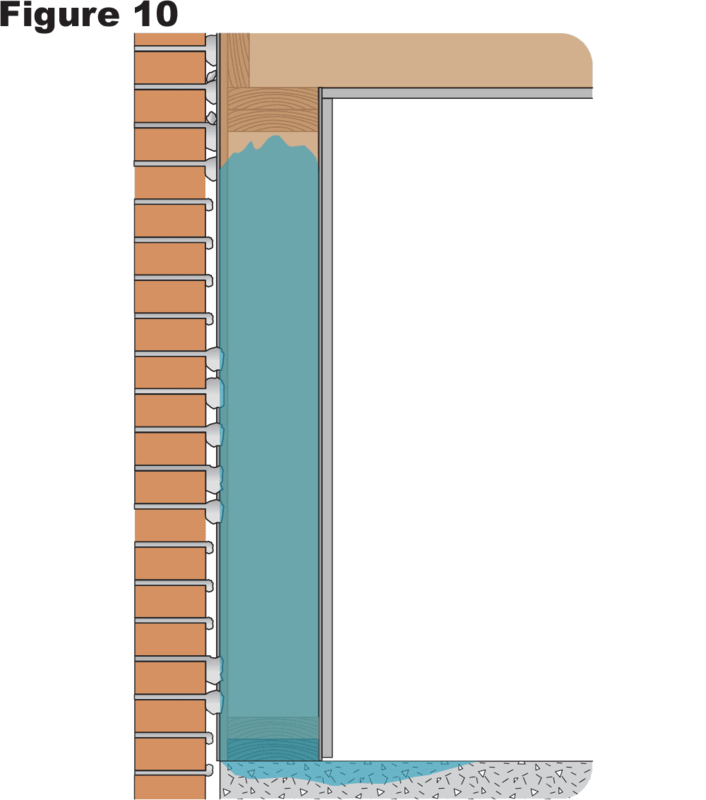 A large volume of liquid water has greater weight (pull of gravity) propelling the liquid moisture into and through construction materials. 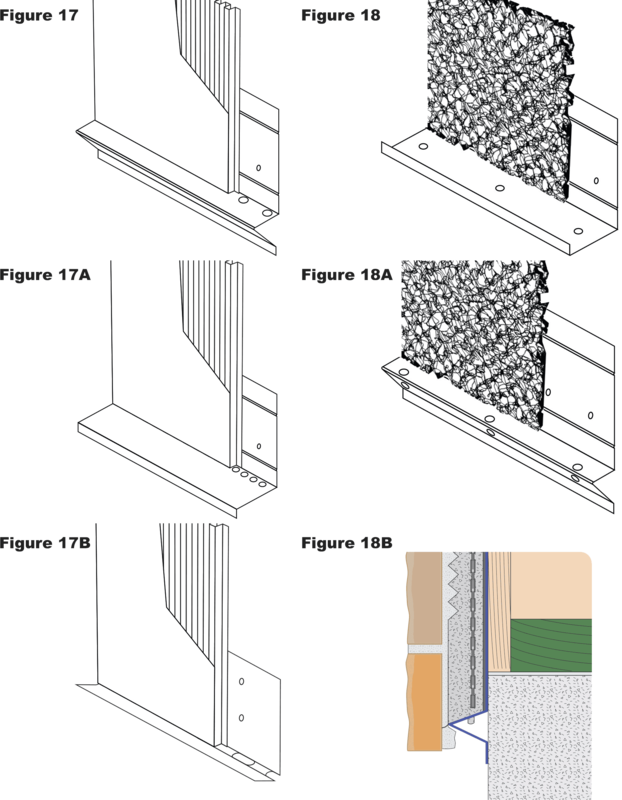 It should be apparent that designing an exterior building envelope moisture management system brings a number of factors into consideration. 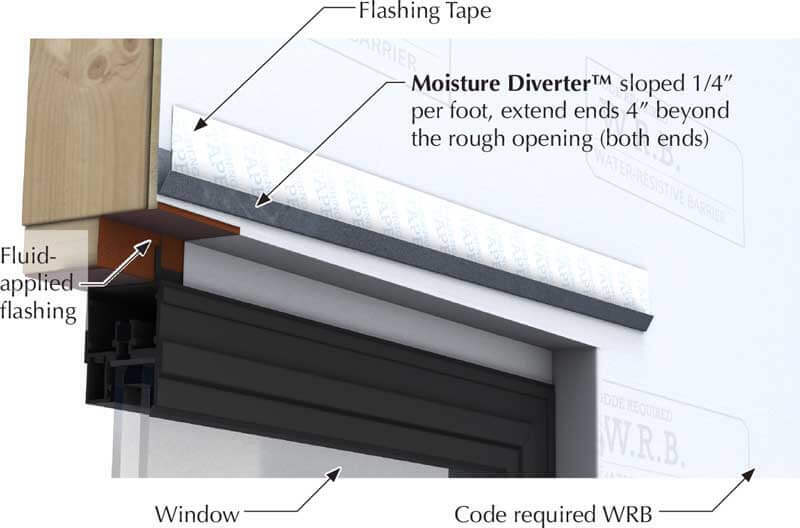 The first, and most important, moisture management design requirement for your building’s details is “Do not let them get wet!” They get wet quickly but they dry out slowly. 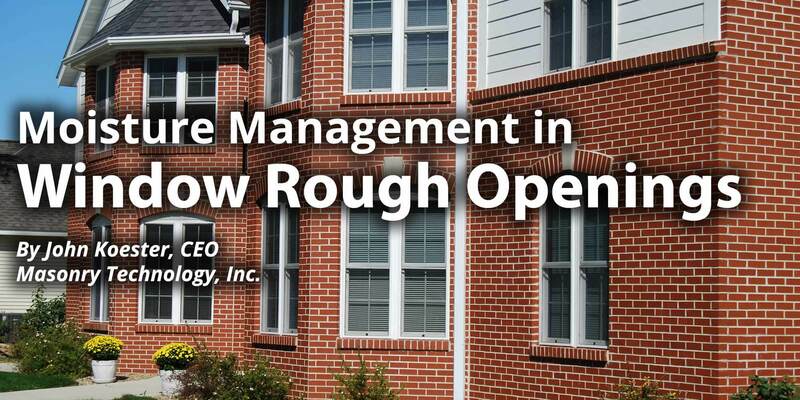 The second moisture management requirement is “Get the moisture away from, off of and out of your construction detail as quickly as possible.” It’s about “Time.” The amount of time moisture is in, on or near your construction detail is really what you are managing. 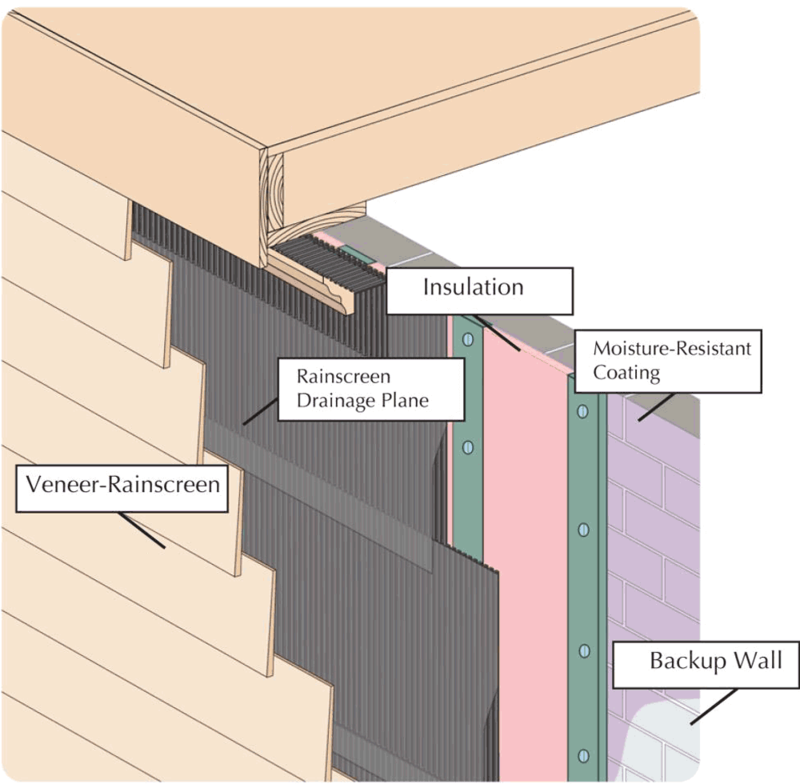 All of these four components are absolutely critical for an exterior building moisture management system to work. 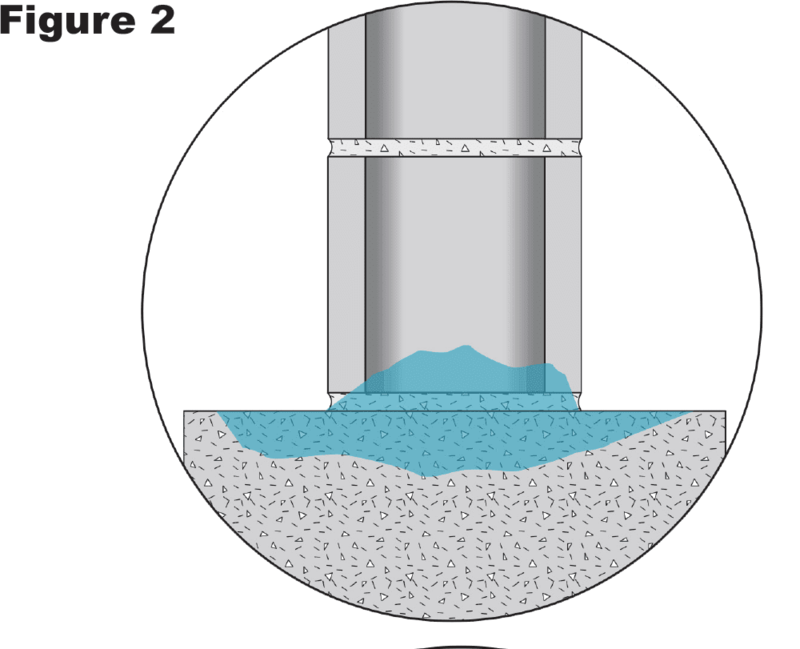 Weeps do not work until the liquid moisture gets to them. 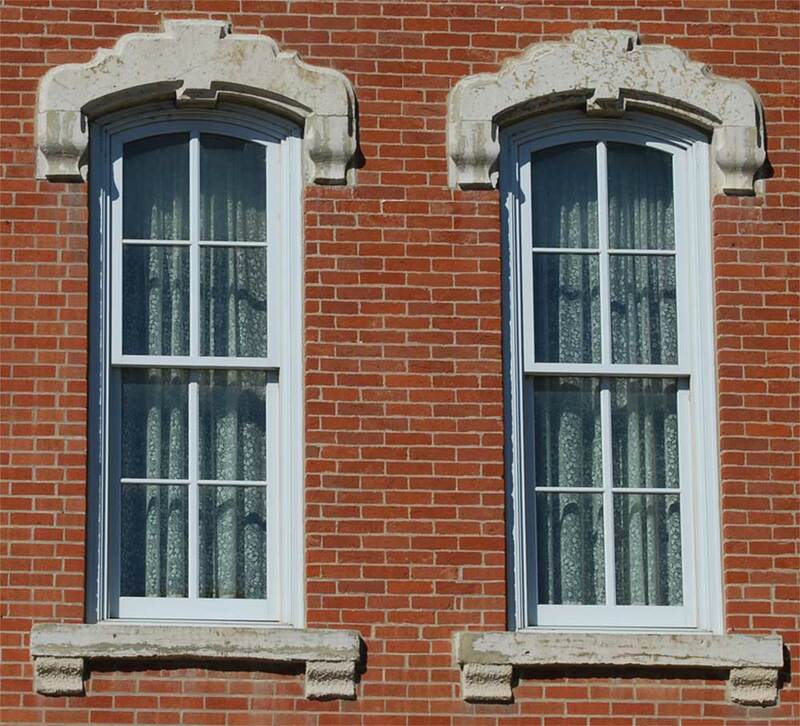 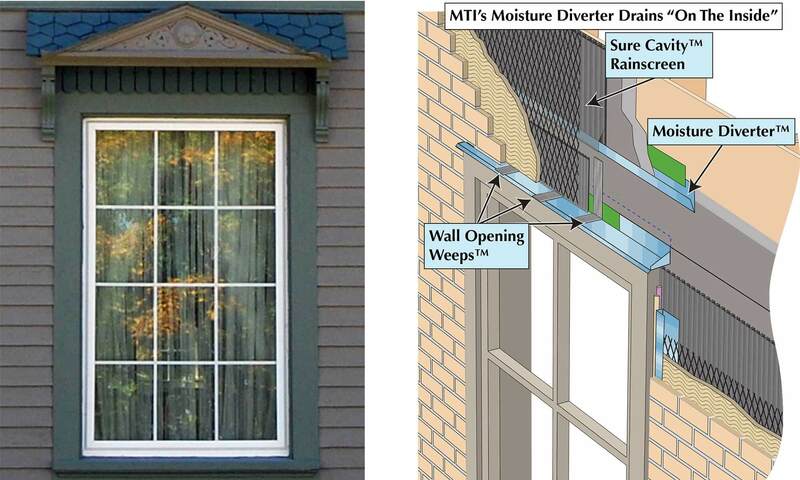 If the moisture that is attempting to move downward in a core, cavity or rainscreen is obstructed or slowed, it may just absorb into adjoining construction material and/or deeper into the exterior building envelope. 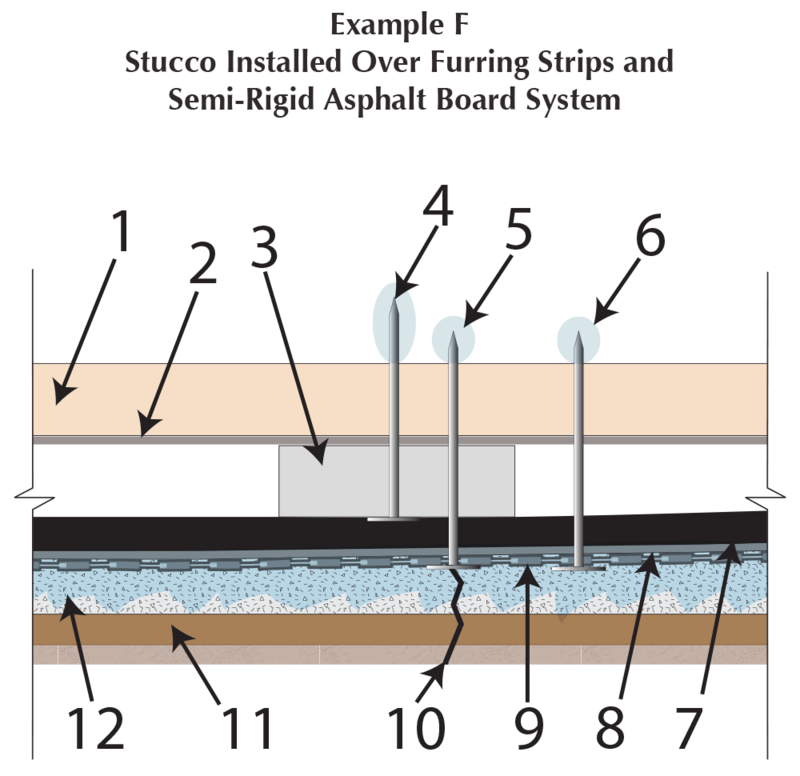 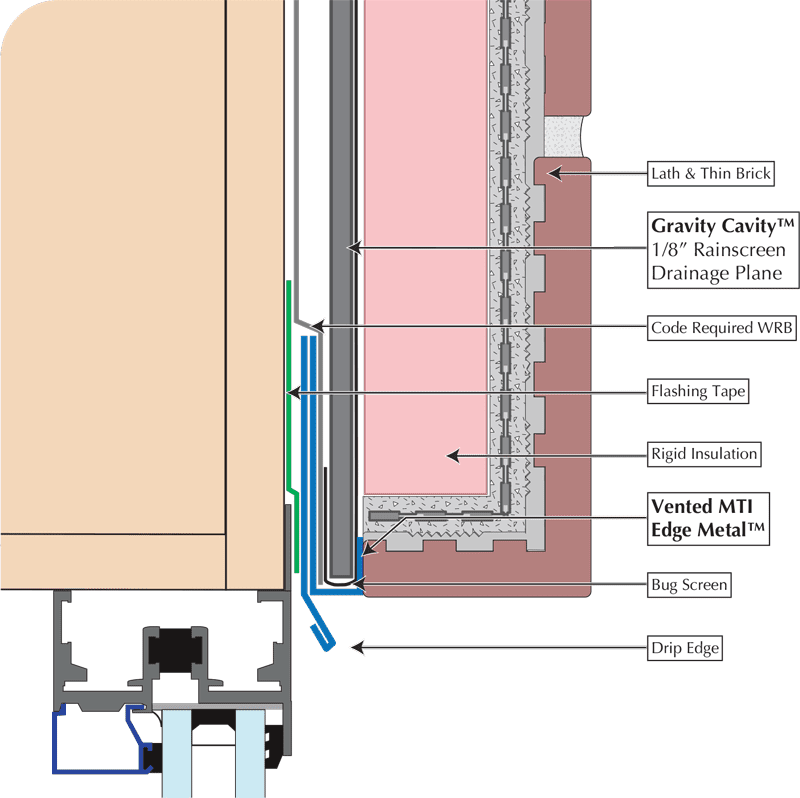 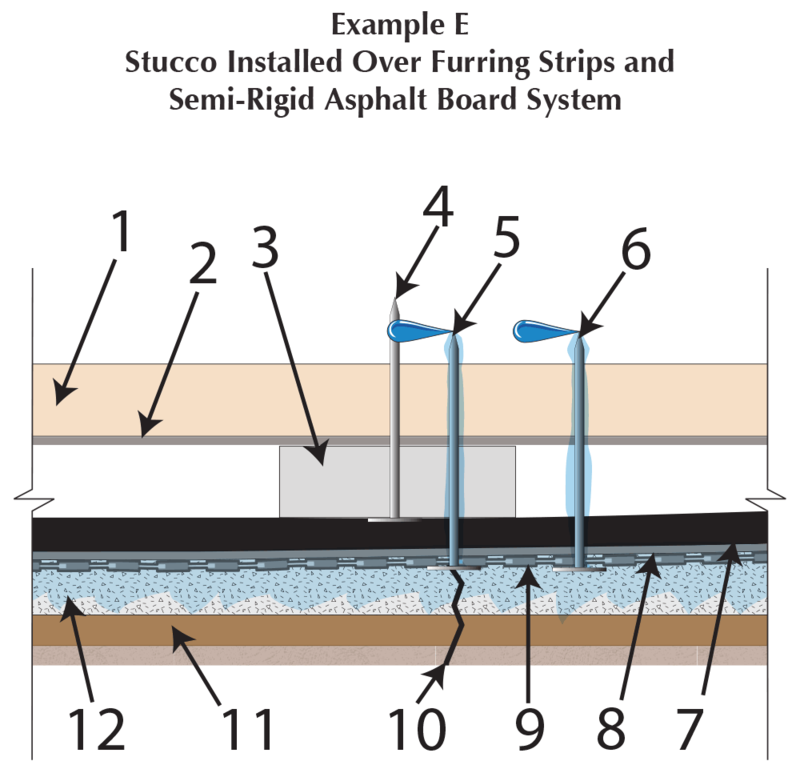 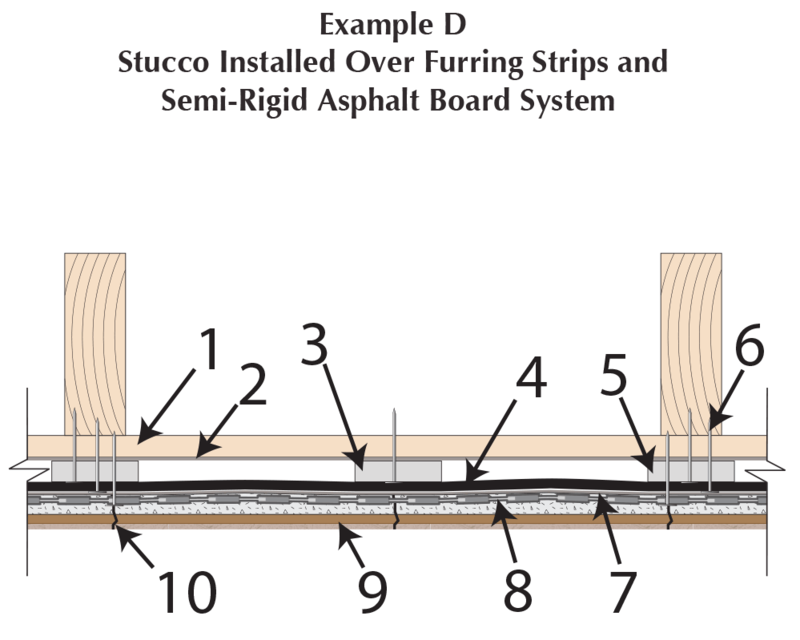 If and when the liquid moisture gets to a flashing/water stop, if there isn’t any slope-to-drain to the exterior of the exterior building envelope, it may just accumulate and absorb into the adjoining construction material or find its way deeper into the exterior building envelope through a void in imperfect flashing or out through veneer material through an undesigned pathway. 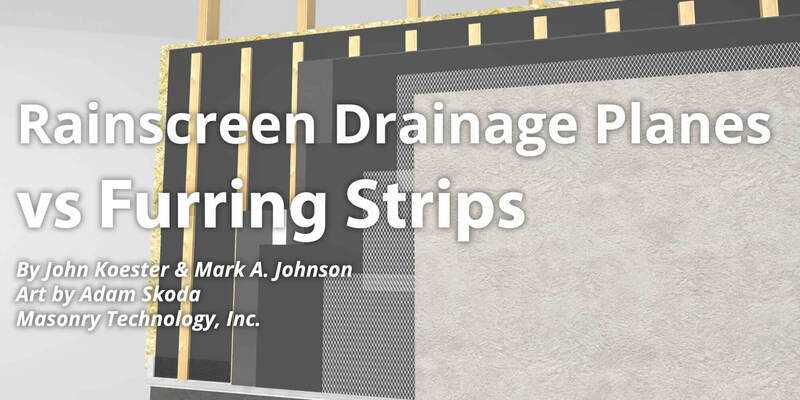 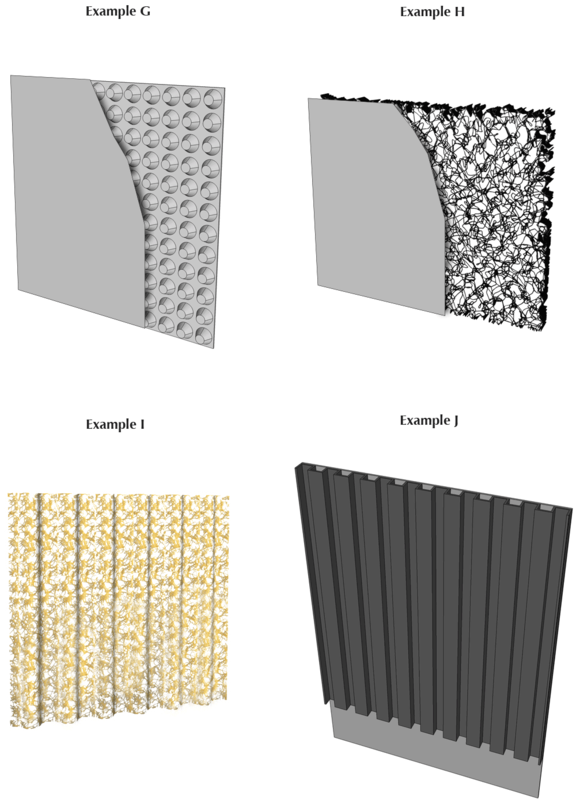 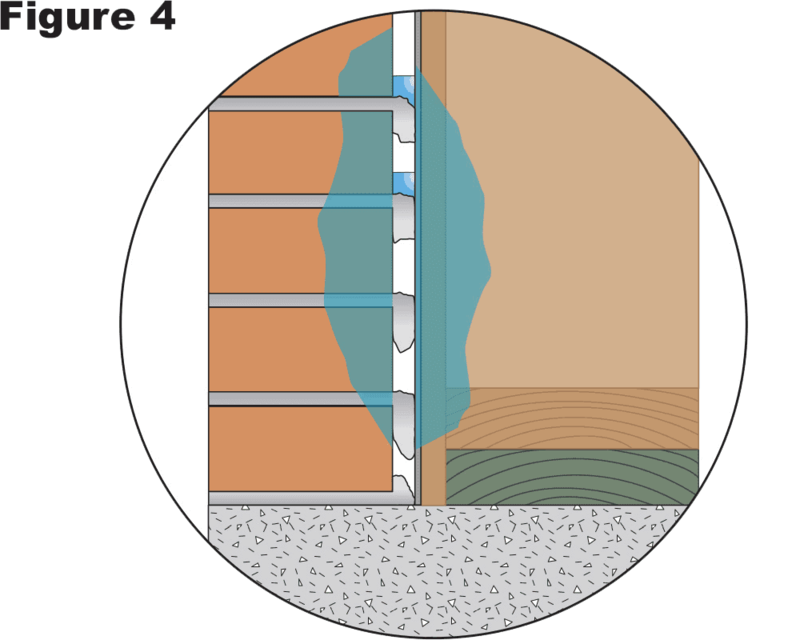 If the weep holes are not at the lowest point of the core, cavity or rainscreen drainage plane, liquid water may accumulate and find its way deeper into the exterior building envelope or through veneer materials through an undesigned pathway. 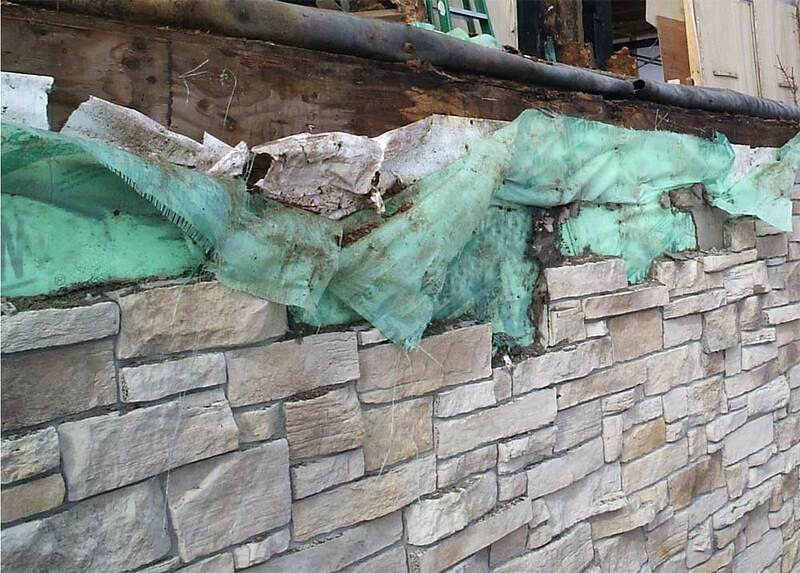 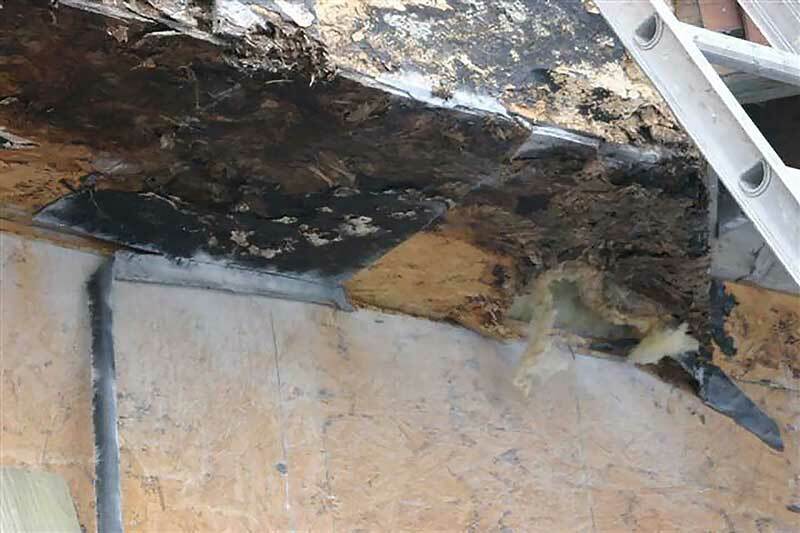 All of these consequences of an improperly designed moisture management system are potentially very serious and may result in exterior building envelope component failure or total system failure, up to and including structural failure. 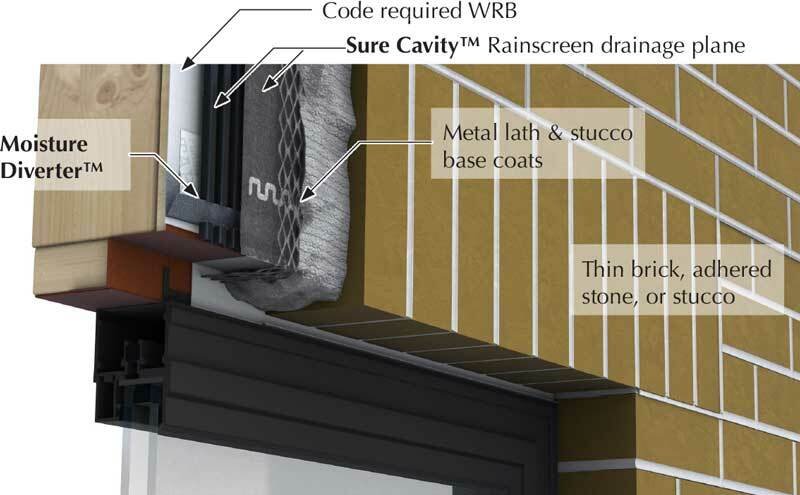 An exterior building envelope moisture management system’s reliance on all components of the system to function in concert with each other cannot be stressed enough! 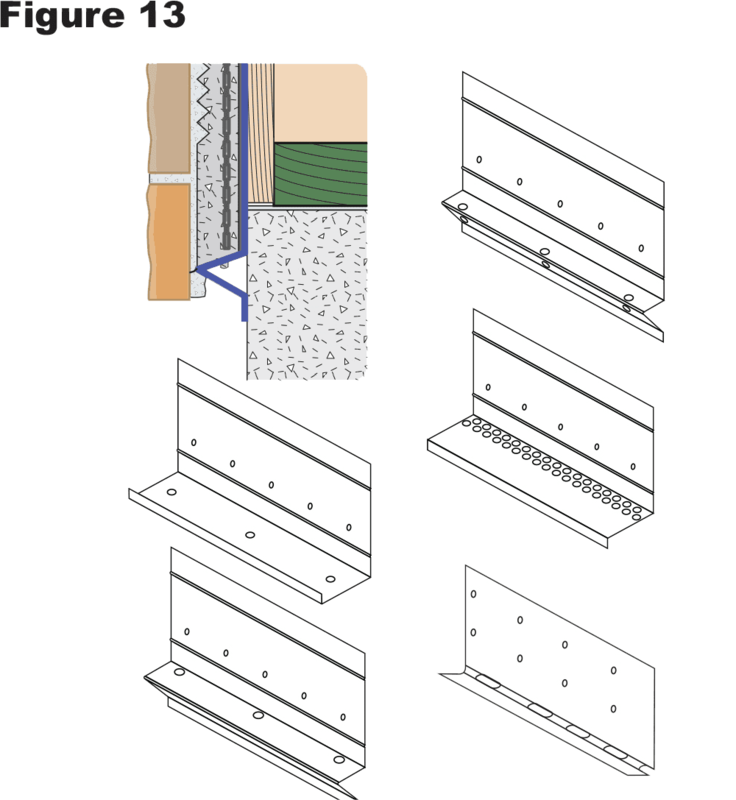 In the case of weeps, materials used, the number used and their location is completely without reason. 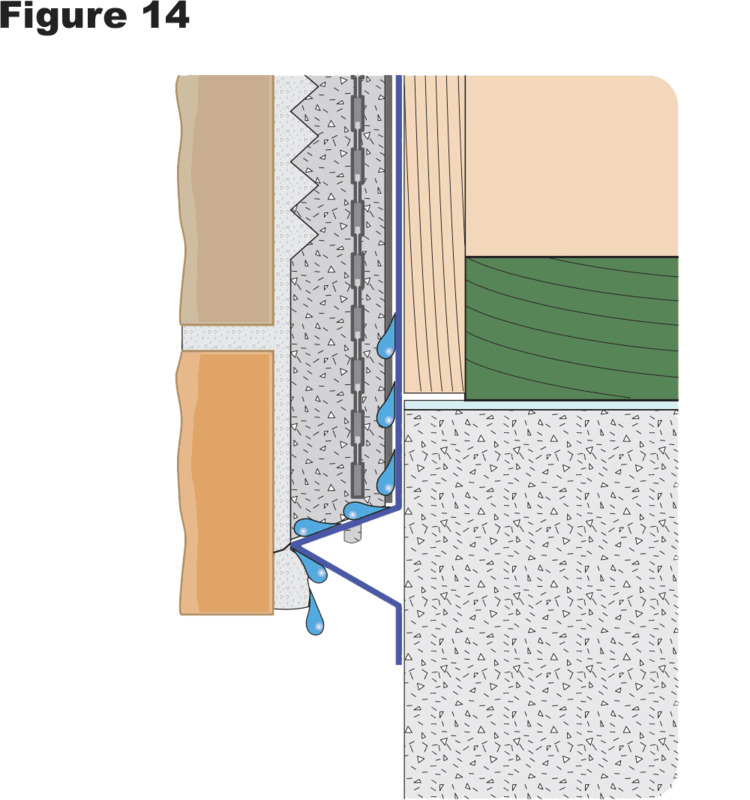 Materials that are often used are thought to wick water out of a core or cavity. 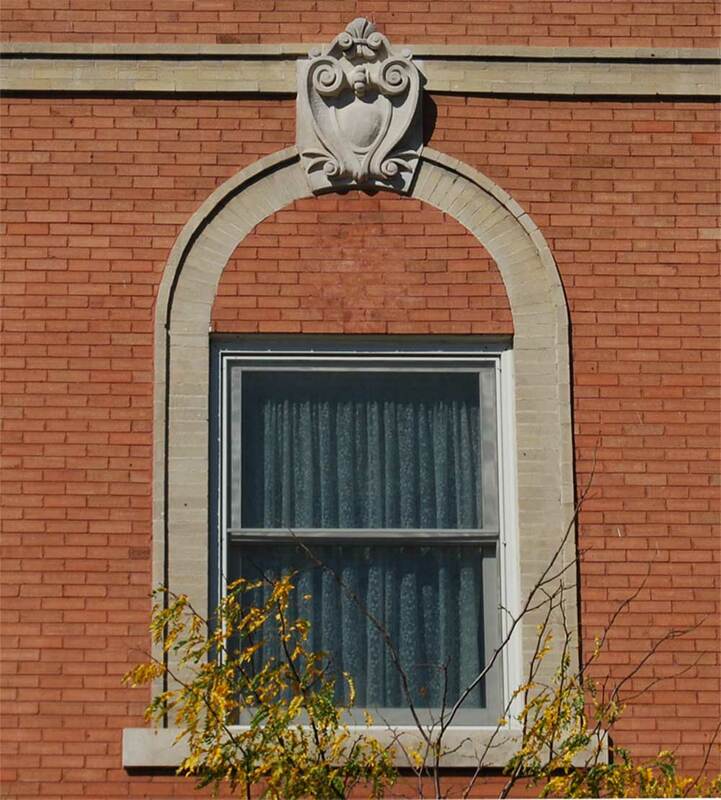 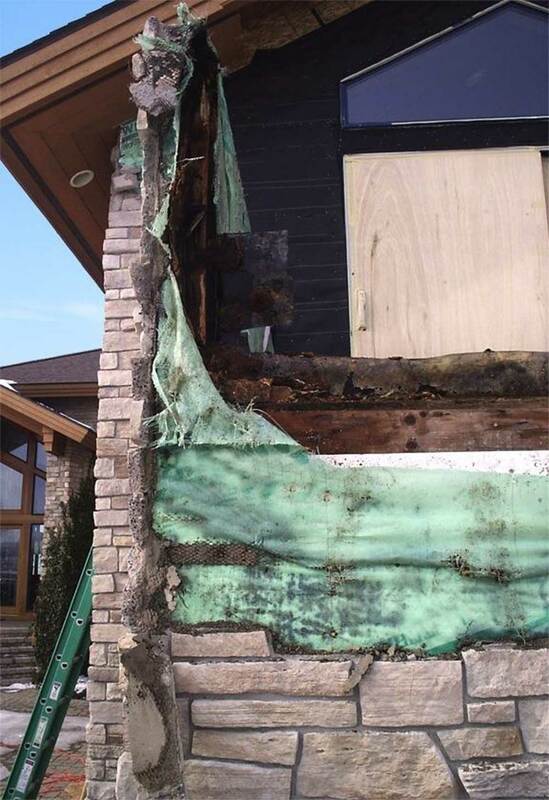 Here is some really good advice – Do not get into a wicking contest with masonry materials! 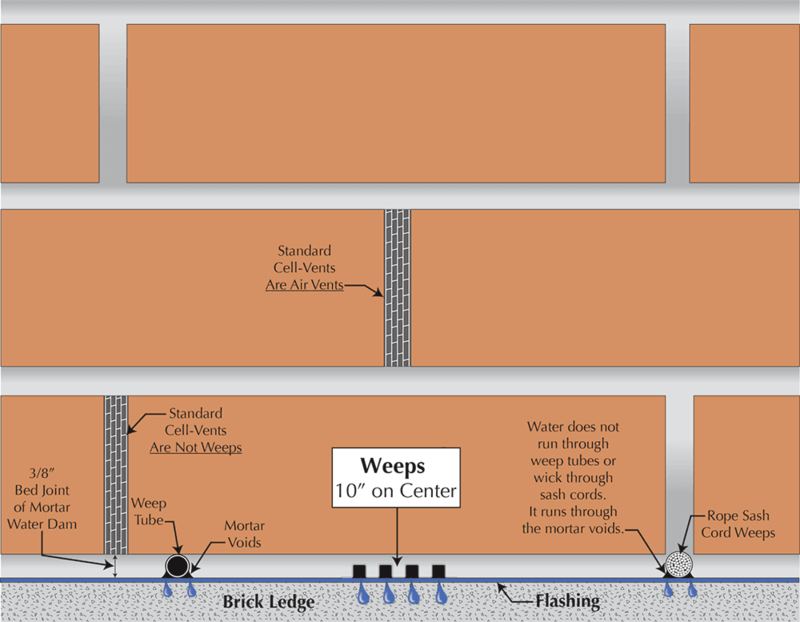 A weep of any kind, good or bad, every 48 inches is of little value. 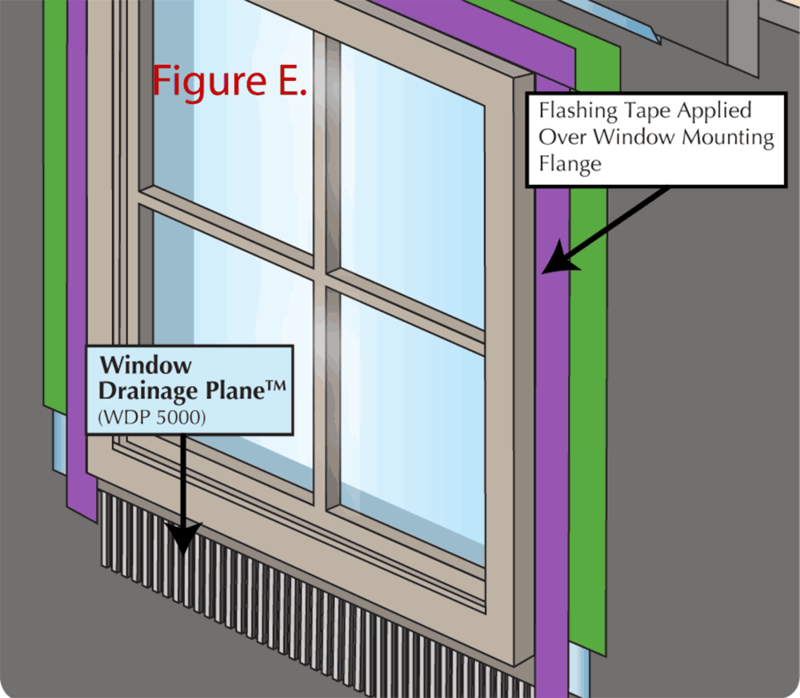 A weep of any kind that is not at the lowest point of a core or cavity which is at the top surface of the flashing or water stop, is of little value. 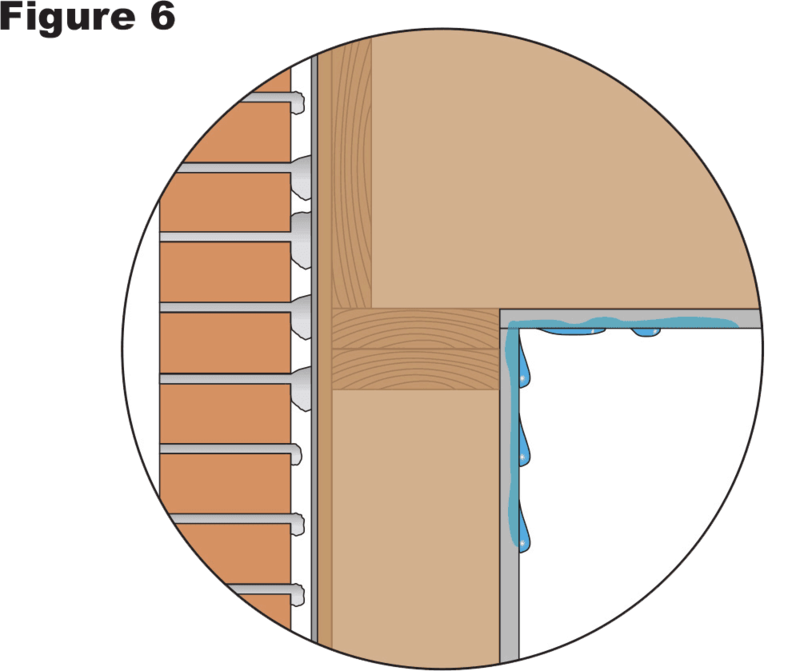 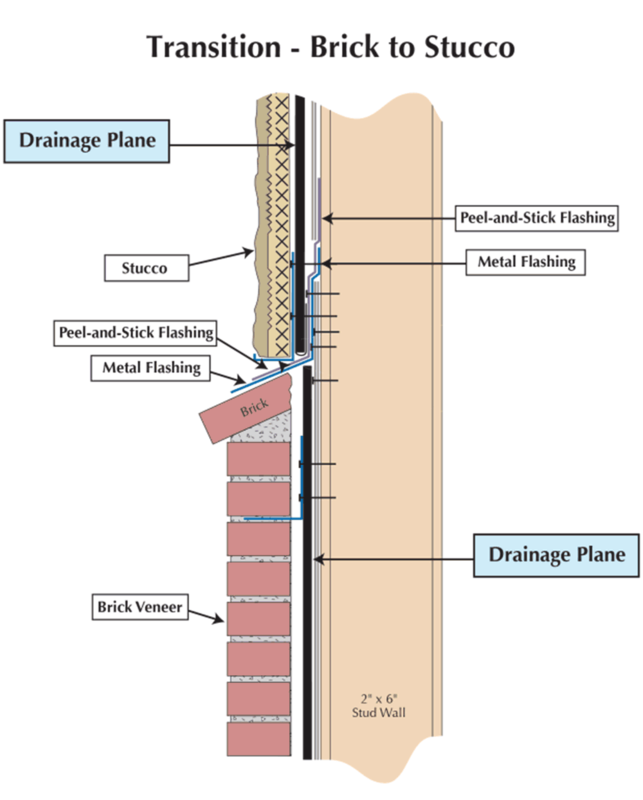 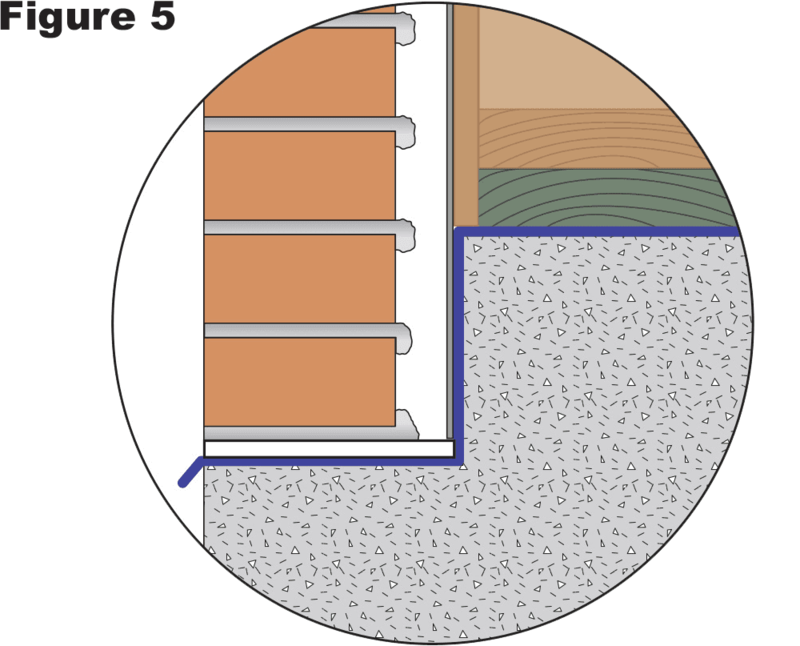 A weep that creates a hole in a veneer from the interior of the core or cavity to the exterior of the veneer is just another hole in the veneer that may let liquid moisture into the wall as well as let it out of the wall if there is no slope-to-drain that keeps it out and drains it out of the wall. 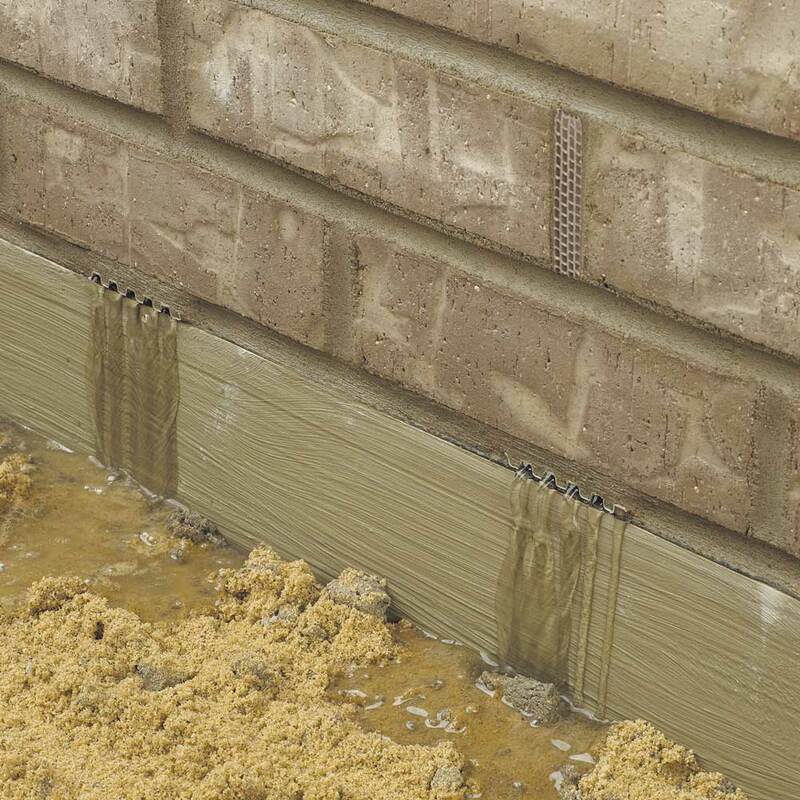 A weep and weep screed must have compatible moisture moving capacity with the core, cavity or rainscreen drainage plane above. 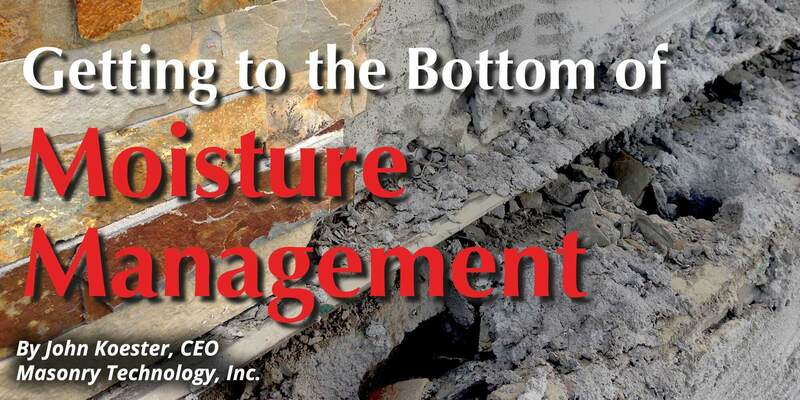 If not, the slowing of moisture movement will cause an accumulative effect with all the negative consequences. 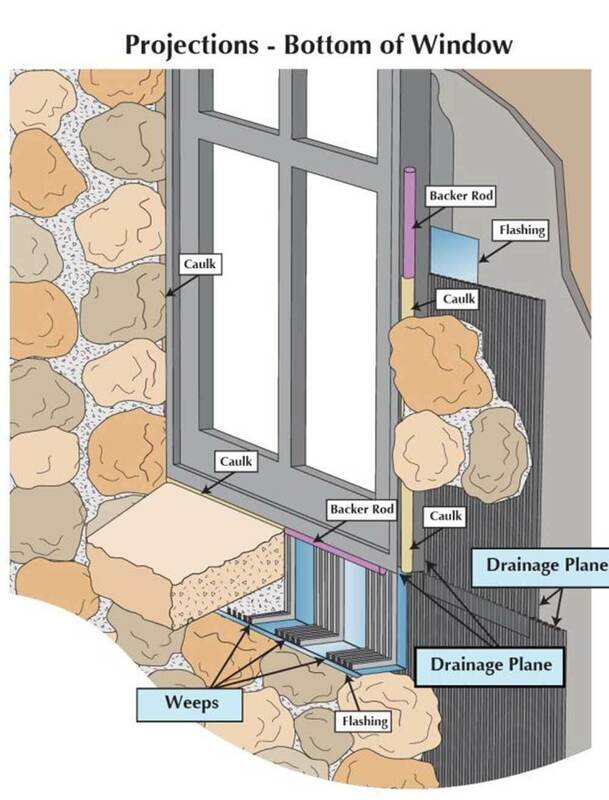 There is no need to consider modular configuration of masonry units because the voids/tunnels and channels are in the bottom side of the bed joint of mortar and do not affect layout or coursing. 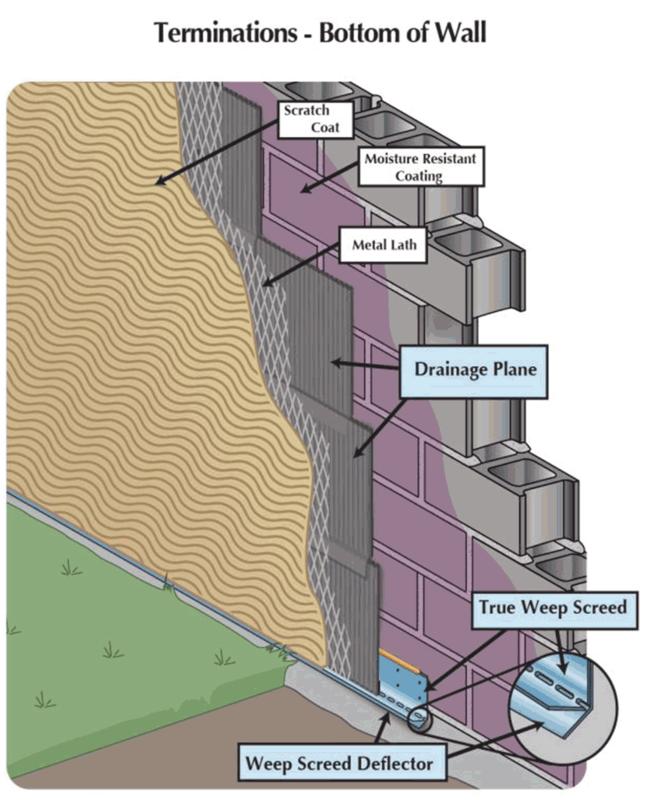 What makes a good weep screed? 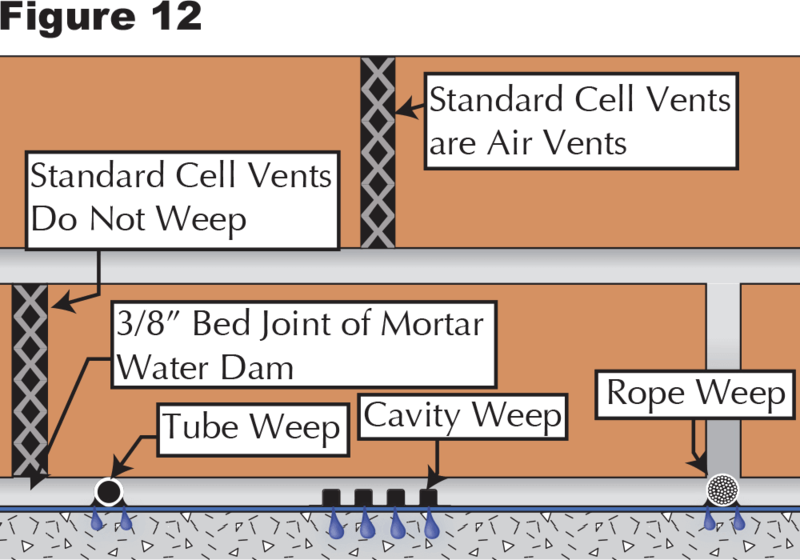 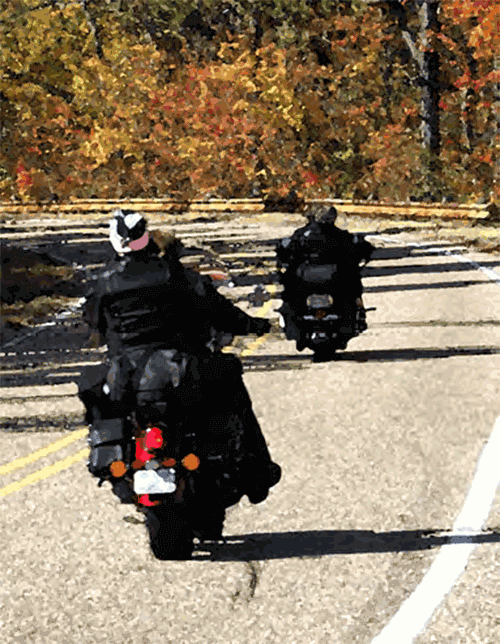 There are specific criteria to follow when choosing weep technology. 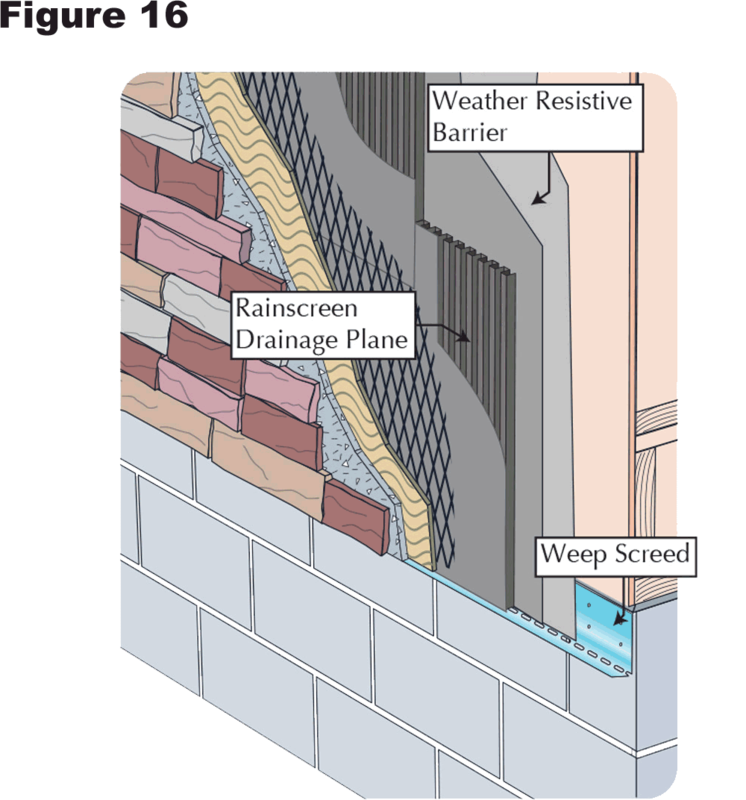 According to wiseGeek.com, “A weep screed is a type of building material used along the base of an exterior stucco wall. 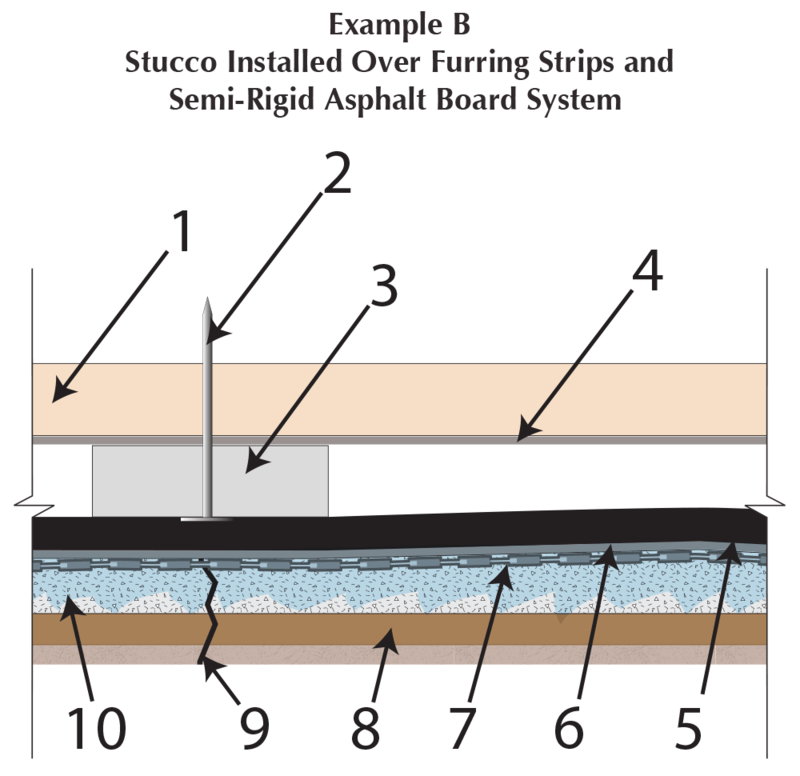 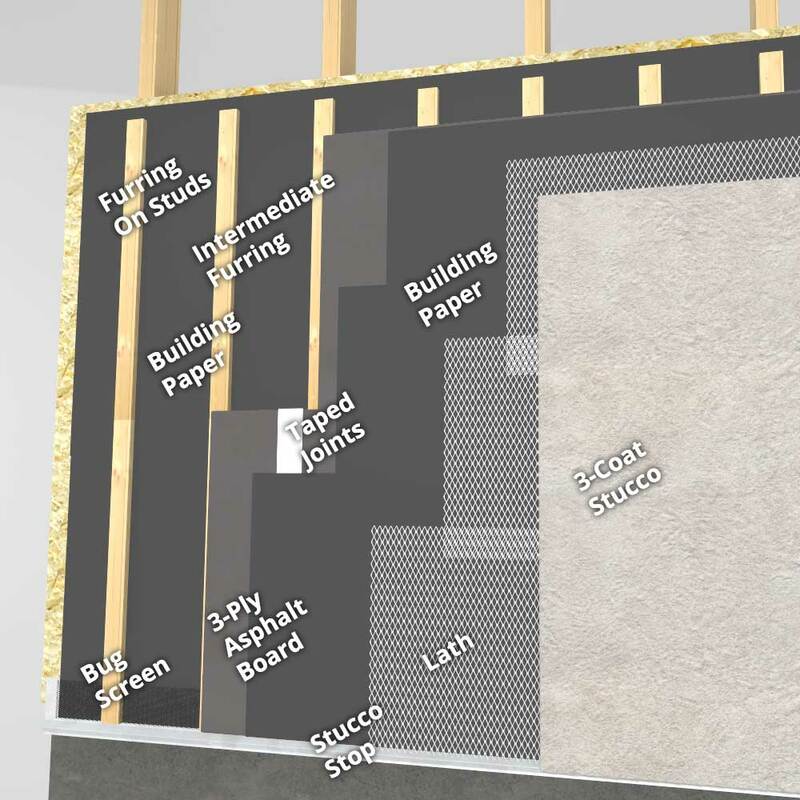 The screed serves as a vent so that the moisture can escape the stucco wall finish just above the foundation.” It is a device used to terminate the bottom of a cementitious-based thin veneer rainscreen. 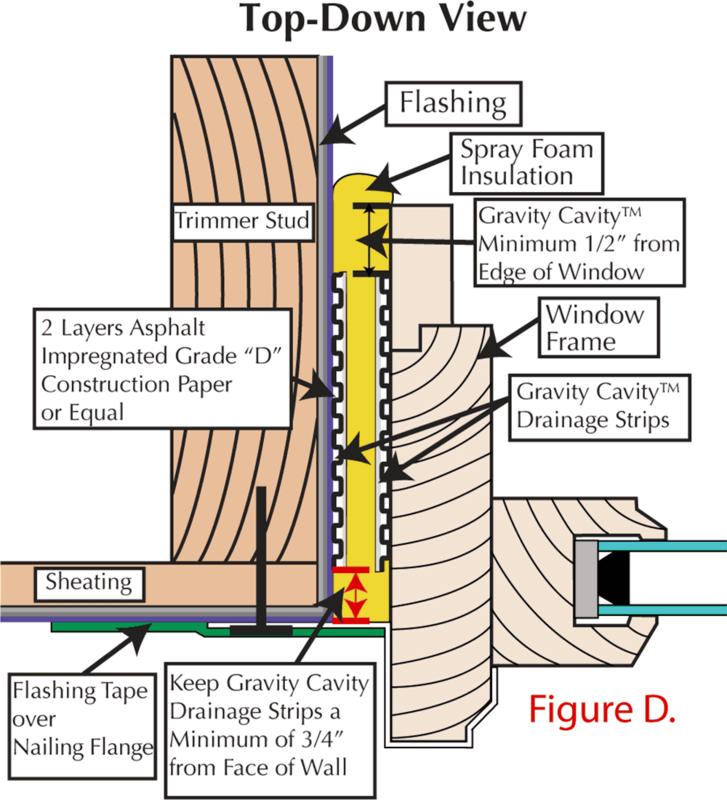 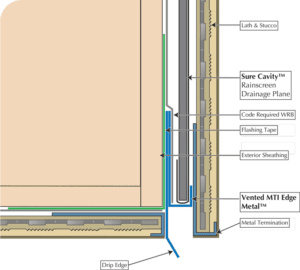 This device should allow liquid moisture that drains down the back side of a thin veneer rainscreen and on the surface of the weather resistant barrier in the rainscreen drainage plane to freely exit the thin veneer 1.5” to 2” below the bottom of the framed wall system and the top of the stem wall. 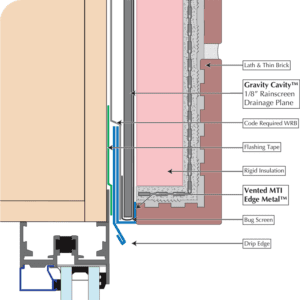 There is little doubt that moisture will enter the building envelope and that it needs to be drained. 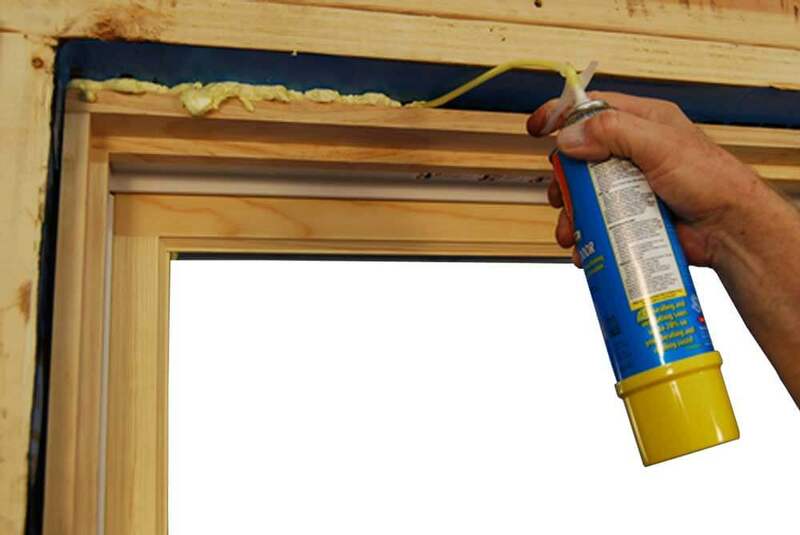 This has become more and more the accepted practice, and in many cases, code mandated. 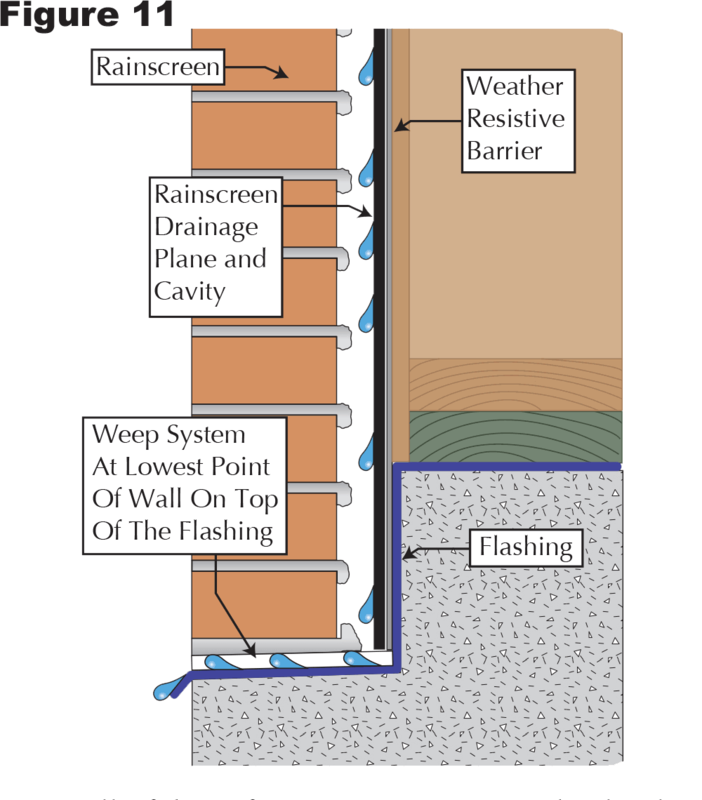 Unfortunately, the liquid moisture gets drained to the bottom of the wall with little thought given as to how it will get out. 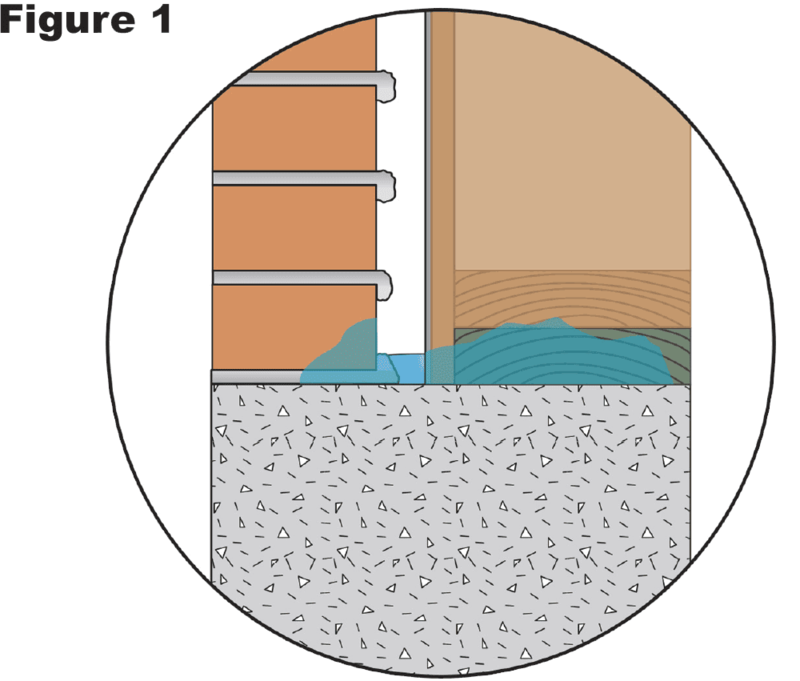 This article has presented pragmatic solutions to getting the moisture out at the bottom. 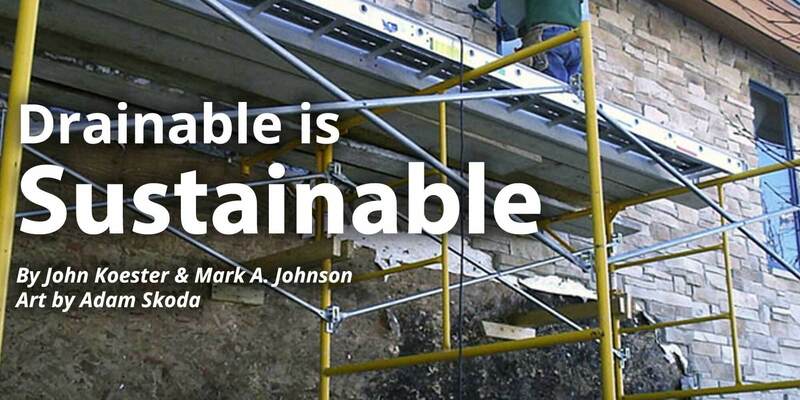 It is up to the reader to make prudent choices in the materials and methods they choose to employ.